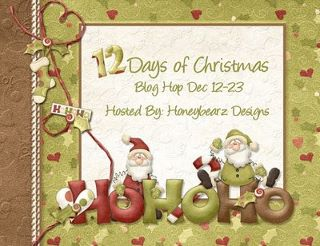 Welcome to Day 1 of the "Twelve Days of Christmas Blog Hop". We are so happy that you decided to Join us . If you arrived here from Mindy's then you are on the fight trail. If you just happened upon my blog and would like to join the fun then please start at the beginning with Lisa's Blog. Today's project is a card I made for a swap earlier this month, I used my Gypsy to design it. I used a traditional Christmas color pallet the card stock is from Recollections the green mat is a piece of scrapbook paper I had in my stash. 5.2 inches. the cardinal was embossed with Devine Swirls embossing folder and outlined with red stickles, The frame was embossed with a Sizzix folder called frost I used some Martha Stewart very fine glitter on the mat as well. The sentiment was from K Andrews " Winter Wishes" set. I finished it off with a Double loop bow in red sheer ribbon from the Dollar Tree Store. I hope you enjoyed your stop and would love for you to leave a comment! Beautiful card. I love the papers you used. Your cardinal is beautiful!! Thanks for sharing your creation with us! Love Cardinals and love this card! beautiful card. love the cardinal. tfs. What a beautiful card, cardinals are special to me because my brother loved them and always pointed them out to me and when he passed away, they are always something I associate with him. Very very beautiful card! Love the sparkle from the glitter. nothing says winter like a cardinal in a snowy scene - love the card! Lovely christmas card. Love the bright white and green with the red cardinal. So pretty. Very pretty design! Just love the bird!